Right, grammar. While speaking, grammar can be a double-edged sword. Damned if you do, damned if you don’t. If you don’t pay attention to grammar while speaking and just wing it, you run the risk of being misunderstood, insulting, or just plain incomprehensible. Most native speakers will let grammar mistakes slide if they know you’re learning the language, but secretly it’s chiseling away at their souls every time you do it. But if you do pay attention to grammar, and it doesn’t yet come naturally to you, you’ll end up stalling your sentences halfway through to check your work or prepare for what you’re about to say, and freeze up like our poor man in the comic above. This is also a fine tool for use in the soul-chiseling of native speakers (“Grammar Cave XII: Soul Chiseler”…I like where this is going). Alternatively, you could do what I do, which is: don’t think about the grammar until you know you’ve screwed it up. Then, go back and repeat what you’ve said five times until you get it right. That way you kill two birds with one stone: you chisel the souls of your unfortunate listener, and you stall the conversation. There’s nothing that thrills native speakers more than when you stop in the middle of a sentence to query them on conjugations. Unfortunately for you (and me), that’s just the way the cookie crumbles. If you can’t stand the heat, get out of the kitchen. Practice makes perfect, and so forth. This article brought to you by: “Grammar Cave XXVI: When Idioms Attack”! How about yourselves? Do you get stuck on grammar, or do you just blow right past it? Do you spend hours boning up with exercises, or do you just learn it over time from context? What’s your favorite “Grammar Cave” video game? I’m afraid I was caught in the era when grammar was not really taught. I don’t know what all those terms actually mean. It makes learning a foreign language damn near impossible. I’ve never had to do a grammar tree. I have no idea what a past perfect is. (See, ended sentence wrong). But oh where does a 60 y/o go to learn proper English? I talk pretty someday. (Thank you David). @Liadan Liadan, I’m with you. We never diagrammed a sentence or used a grammar tree. First I have to figure out what past imperfect means before I can learn the conjugations, but if I go by what past imperfect means instead of going by the term past imperfect, I can conjugate verbs much more easily. What I do is learn what the term means, do some exercises with that specific conjugation, and memorize the term afterward so I know where to files that juicy little indicator next time I’m asked to conjugate a verb in that conjugation. Example: “to be.” I understand the meaning is “to be.” I do exercises conjugating “to be” in various conjugations until I feel comfortable doing them. Afterward, I memorize under which grammar term category they belong. I’m learning the new language first and applying grammar terminology second, which feels more intuitive for me. @Sheila Morris My take on this is it varies – some languages have very steep learning curves at the beginning – Japanese and Russian are examples. After a lot of of effort the challenges of correct grammar fade (a bit ;-)…. 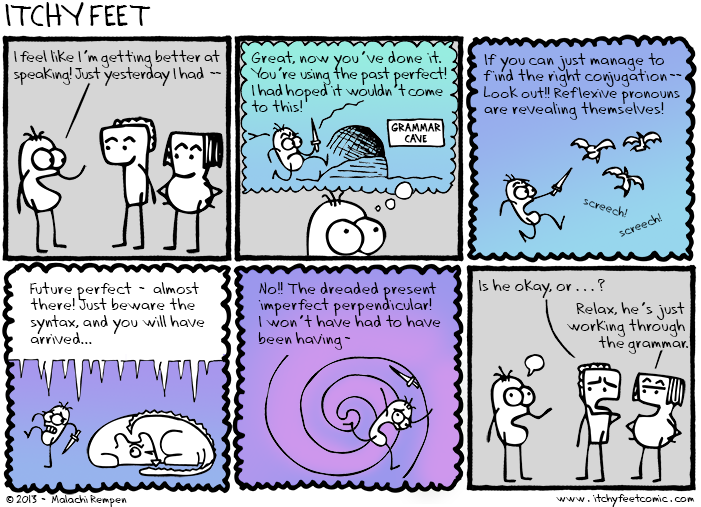 you will emerge from the grammar cave after a longer or shorter time depending on the effort you invest! What will sill give you away as a foreigner after 20 years or more of practice is pronunciation, so things that appear simpler than grammar in the beginning will still trip you up a long way down the road – Russian “udarenie” (pronunciation) – Шипящие (snake sounds …consonants with sh sch shch etc… as well as even basic vowel sounds like i ui (ы) will still “out” you. Japanese counting words (josushi) remain for me difficult but again in this case it’s just brute memorising and work that get you past these obstacles – there is unfortunately, no easy way. Finally i suppose the most difficult languages for westerners to master are chinese or korean. That terrible combination of reading difficulty – no real analogy to Japanese hiragana in Chinese, and tonal language make both a formidable challenge. I like learning grammar, I know most about structures and times such as present perfect, future forms, verbs, noun, time clauses, progressive and passive sentences. Moreover, I’ve always thought grammar is one of the most important things (and vocabulary) when you’re learning a new foreign language. But with so many several structures, times, rules and so on, it becomes in a hard task and the only way to overcome any mistake is practicing, practicing and practicing! Figuring out what the grammar term means! Then being awarded a key to the door behind which the verb waits to be conjugated according to that term. After matching the verb to the requested conjugation, a second door to the world of conversation opens.